Poison Ivy remembers back to her dream state, a new ability she gained from her connection to The Green. There she met her 'daughter' and raised her after the events of Poison Ivy: Cycle of Life and Death this dream world was all she had... until Mongul appeared there and cruelly ejected her from the dream plane. Ivy in the real world explains that one of the three people she has captive is emitting so much solar energy that it can be used as a gateway back and forth. To stop being pulled away ever again she wants to use Clark, Bruce & Diana to make it happen. In the dreamworld the Trinity battle Mongul but, as he is all powerful in this realm, he easily bests them. Mongul explains they are trapped inside his Black Mercy fantasy where he has lived for many years. Somehow inside the fantasy his daughter was born and, though they enjoyed all the death and destruction, they were shocked when The Green allowed Poison Ivy access to the dream plane. The two villains realized they could manipulate her love of the child into getting them out to the real world. Back in Hamilton County Ivy explains to a captive Lois that she wants to create a portal for her 'daughter' to escape through. Using her powers and channelling the solar energy from Clark the doorway opens and the dream is over. Story - 5: They story is now making more and more sense and suddenly I find myself really sympathetic to poor Poison Ivy. The Trinity really don't do much this issue, it was all for the villains to do their stereotypical 'gloat the plot' scenes. 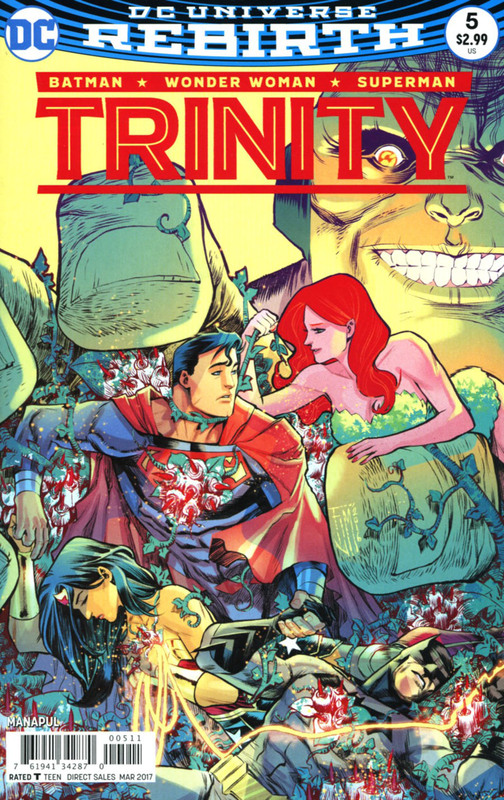 I don't mind that as a plot device as the Trinity have each had the spotlight on them as the story moved forward. I am psyched for the next issue as it is no longer dreams but real physical consequence at stake. Now all the weirdness is over we can finally see Superman, Wonder Woman and Batman not hold back. Art - 4: The inking later in the book past page 11 begins to look a bit heavy but over all Francis Manapul crafts some magnificent visuals. Diana steals the show in the fight scenes this issue and Ivy looks stunning in the dream world. The Superman cameos on page 15 were a nice easter egg, I'm glad this is only a fantasy though! Cover Art - 4: Not as strong a cover as I had hoped, I think the color hue weakens it somewhat. But even as a showcase for the story it's still nowhere as strong as the past covers, variant or otherwise. Variant Cover Art - 3: I know I'll take some flak here but I really don't like this cover. 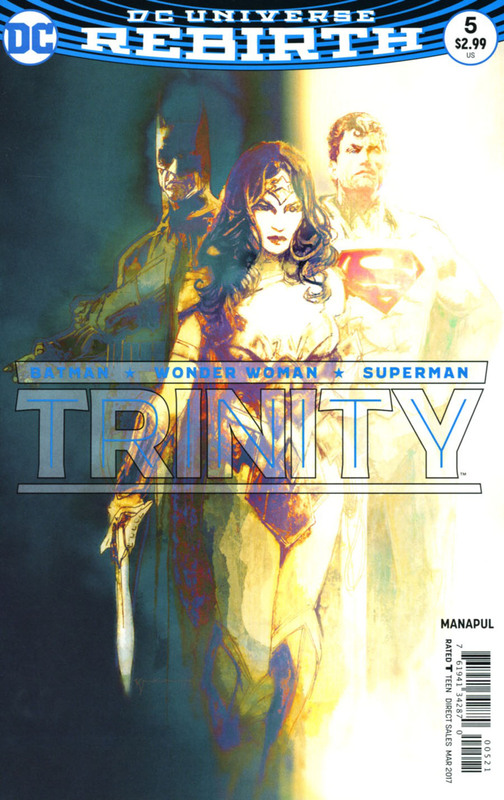 I know it is yet another presentation of the three titans of DC and Sienkiewicz has a unique style, it is just that this particular style doesn't grip me at all. It just doesn't fit the book at all.